Ruth Bader Ginsburg is the second woman ever to sit on the United States Supreme Court and is known as the legal architect of the modern women's movement. She, more than any other person, pointed out that many laws encouraged gender discrimination; that is, they led to better treatment of men than women instead of guaranteeing equal rights and opportunities to all as was intended by the United States Constitution. Ruth Joan Bader was born March 15, 1933, to Nathan and Cecelia (Amster) Bader in Brooklyn, New York. Her mother was a role model in Ruth's life at a time when women had to fight for the privileges and rights that men took for granted. "I pray that I may be all that she would have been had she lived in an age when women could aspire [seek to reach a goal] and achieve and daughters are cherished as much as sons," the New York Times quoted Ginsburg as saying of her mother after she was named to the Supreme Court. Cecelia Bader had once hoped to attend college but instead went to work in a garment factory to help pay for her brother's education. This was a sacrifice many women made in the early decades of the 1900s. Ruth Bader loved to read and learn. Her interest in the law started in grade school, when she wrote articles for her school newspaper about the Magna Carta, a document that represented the first step toward freedom in English-speaking lands. She attended Cornell University, where she graduated with high honors in government. She then married Martin Ginsburg, a law student. She went on to Harvard Law School, where she served on the Law Review. In the male-dominated world of law, Ruth Bader Ginsburg was told that she and her eight female classmates—out of a class of five-hundred—were taking the places of qualified males. She transferred to Columbia University after two years when her husband, who would become one of the country's top tax lawyers, took a job in New York. Here she continued to encounter gender discrimination; although she graduated at the top of her class, law firms, which normally welcome talented graduates, refused to hire her. After working for District Judge Edmund L. Palmieri in New York, Ginsburg joined the faculty of Rutgers University, where, in order to keep her job, she wore overly large clothes to hide the fact that she was carrying her second child. She was only the second female professor at Rutgers and one of only twenty women law professors in the country. In 1972, after teaching a course on women and the law at Harvard University, she was appointed the first female faculty member in the law school's history. women's rights. A former ACLU colleague was quoted as telling the Legal Times, "We were young and very green. She had it all so carefully thought through. She knew exactly what she needed to do." In a 1973 case before the Supreme Court, Ginsburg successfully argued against a federal law that gave more housing and medical benefits to male members of the armed services than to females. However, she did not argue only cases in which women were the victims of discrimination. She believed that the law must give equal rights to all groups. For instance, she convinced the court that a portion of the Social Security Act (a law that provides protection for people against loss of income due to old age, disability, or death) favored women over men because it gave certain benefits to widows but not to widowers. After winning five of the six cases she argued before the Supreme Court, Ginsburg was named a judge on the United States Court of Appeals for the District of Columbia by President Jimmy Carter (1924–). She brought a cautious, thoughtful style to the court, and most people were pleased with her performance. Conservatives, who for the most part like things to stay as they are, agreed with her view that courts should only interpret laws and leave their creation to politicians. On the other hand, liberals, or people who are usually more open to change and reform, were pleased with her votes supporting broadcasting access to the courts. With the retirement of U.S. Supreme Court Justice Byron White (1917–) in 1993, President Bill Clinton (1946–) wanted a replacement with the intellect and the political skills to deal with the Supreme Court's top conservatives. He chose Ruth Bader Ginsburg. Court observers praised her commitment to the details of the law, her intelligent questioning of lawyers arguing before her, and her talent for using calm and sensible arguments to win over her fellow judges. The Senate Judiciary Committee hearings to approve the choice of Ginsburg were unusually friendly. Committee Chairman Joseph Biden (1942–) said, according to the Boston Globe, that Ginsburg had "already helped to change the meaning of equality in our nation." Ginsburg was confirmed by the Senate in a vote of ninety-six to three, becoming the 107th Supreme Court Justice and its second female jurist after Sandra Day O'Connor (1930–). She was also the first justice to be named by a Democratic president since 1967. President Clinton said in a statement quoted by the Detroit Free Press, "I am confident that she will be an outstanding addition to the court and will serve with distinction for many years." Since taking office, Ruth Bader Ginsburg has written thirty-five significant opinions (formal statements written by a judge), two important concurring (agreeing) opinions, and three selected dissenting (opposing) opinions. Ginsburg was seen as a stronger voice in favor of gender equality, the rights of workers, and the separation of church and state (the belief that neither the church nor the government should have any influence over the other) than many of the other judges on the Supreme Court. In 1999, she won the American Bar Association's Thurgood Marshall Award for her contributions to gender equality and civil rights. As more and more women became judges throughout the country, Justice Ginsburg gave former president Carter credit for changing the judicial landscape for women forever. Appearing at a program entitled Woman and the Bench at the University of Pennsylvania Law School, she said, "He appointed women in numbers such as there would be no going back." Ruth Bader Ginsburg deserves equal credit for surviving and fighting through the discrimination of the past to help bring about change. Ayer, Eleanor H. Ruth Bader Ginsburg: Fire and Steel on the Supreme Court. New York: Dillon Press, 1994. Bredeson, Carmen. Ruth Bader Ginsburg: Supreme Court Justice. Springfield, NJ: Enslow, 1995. Italia, Bob, and Paul Deegan. 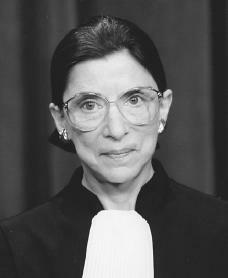 Ruth Bader Ginsburg. Minneapolis: Abdo & Daughters, 1994.